Hasselblad is one of the most venerable names in photography – its cameras have gone to the moon, after all – but some would argue the value of their $30,000 cameras has been diluted by modern DSLRs and mirrorless cameras, which constantly improve their image quality in much smaller, cheaper packages. Now Hasselblad is fighting back with the world’s first-ever medium format mirrorless camera, putting a humongous sensor into a body not much bigger than current mirrorless offerings. And though $9,000 is certainly not cheap, it’s much cheaper than anything else Hasselblad offers, while being different enough from the mirrorless competition that there isn’t really anything else you can directly compare it to. Hasselblad isn’t going to take over popular options from Sony, Fuji or Olympus anytime soon, but that’s not what it’s going for; this is a company that still hand-makes all it’s cameras. It’s offering something here that the world hasn’t quite seen before. That $9,000 price tag is still enough to make me weep, but at least it’s closer to Leica-expensive than to buy-a-luxury-car expensive. It puts medium-format photography in a more palatable price range for most professionals (some of whom just rent), and even some enthusiasts with fatter wallets. While the Pentax 645Z already brought medium format photography to a reasonable-ish price range, it couldn’t do much about the size and weight of the format, relegating it to mostly being used for professional shoots only. The X1D is smaller than your average DSLR, so it could actually fit in a standard camera bag or purse. That portability is a big deal, given photographers associate medium-format cameras with slow, methodical studio or landscape shoots. Aside from a few outliers, the gear is simply too big, heavy and expensive for anything else. The X1D, on the other hand, is small enough that I could carry it with me every day. Medium-format street photography might actually become a thing for the first time since the film days, and competitors might begin to catch on. It’s also worth noting that while the sensor is the same huge one found in the company’s H6D-50c, it’s not quite as large as the company’s H6D-100c, which is still about 47 percent larger (44 x 33 mm vs 54 x 33 mm). That means Hasselblad still has some room to differentiate in its traditional medium format series for the absolute best picture quality available. The X1D uses a new XCD lens mount and is launching with two lenses: a 45mm F3.5 wide-angle lens, and a 90mm f4.5 short telephoto. There will also be an adapter for Hasselblad’s 12 H lenses. The camera will retail for $8,995 for the body only. The first two native lenses will cost $2,295 and $2,695, respectively. There’s aslo a kit with the 45 mm for $11,290 or one with both lenses for $13,985. 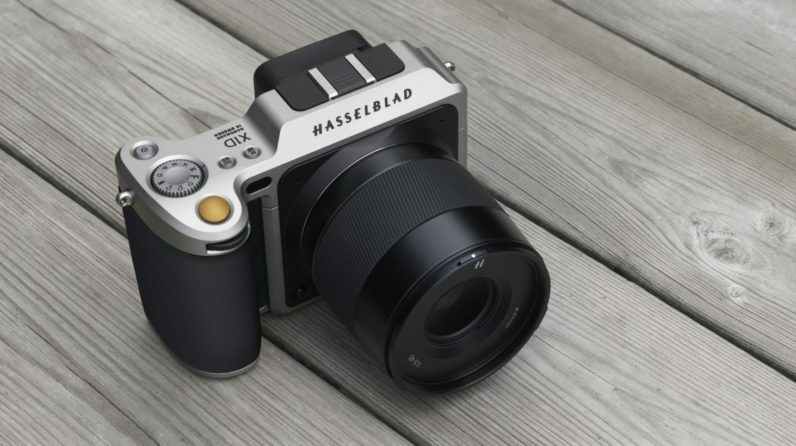 Hasselblad will begin offering demos for customers in July, and it will ship out in August. We’ll be going hands-on with the X1D soon, so stay tuned for more.